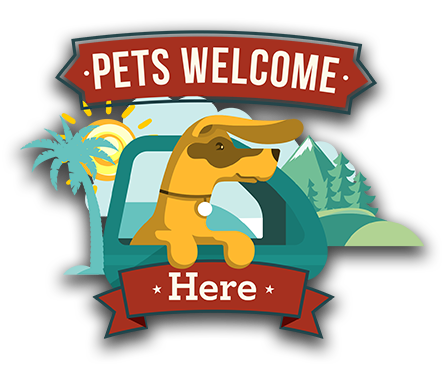 “Pets Welcome Here” TV Show Focuses on St. Augustine’s ‘Pet-Friendly’ Ways! BIG DOGS ARE A BIG DEAL IN LAKE PLACID, N.Y. Known for hosting the Olympics and for winter sports, Lake Placid in the New York Adirondack Mountains is a vibrant year-round vacation community with spring, summer and fall outdoor activities that are unsurpassed for Adirondogs and the people who love them. While dogs (and cats) of all sizes are welcome, big dogs seem to exceptionally like the sights, sounds, smells and activities of this one-of-a-kind destination. In fact, Lake Placid is so pet friendly, locals say the community has more dogs than people! Our adventure of discovery explores Spring-Summer in Lake Placid when the weather is perfect to get out and go places with your furry best friend. Numerous hiking trails welcome your four-footed hiking buddy to sniff out interesting new smells as you take in the panoramic beauty of the area. Trails range from level and easy to mountainous climbs for experienced hikers. Everyone is welcome at the John Brown Farm Historic Site featuring John Brown’s farmhouse, grave site, a historic museum and 5 different “easy-to moderate” hiking trails that start at the farm. There’s also a large meadow where dogs are invited to romp and play off leash and a small, fun “swimming hole” where pets and their people can cool off on a warm day. Possibly the nation’s greatest road trip with your dog is the ride up the Whiteface Veterans’ Memorial Highway to the top of Whiteface Mountain—New York’s fifth-highest peak at 4,867. The road leads directly to the summit, with viewing areas along the way that span hundreds of miles of wild land reaching as far as Vermont and Canada. At the summit you’ll find a castle built from native stone, a restaurant and gift shop, an elevator carved deep inside the mountain top itself, and a truly spectacular 360-degree, panoramic view of unparalleled beauty. In Lake Placid, if someone tells you to “go jump in the lake,” take their advice. Lake Placid is on the shores of scenic Mirror Lake, where the public beach provides a special area for dogs to swim and frolic in the water. Canoeing, kayaking and Paddle Boarding are available and experienced pets are welcome on board to enjoy the ride. No trip to Lake Placid would be complete without discovering the many pet friendly shops along Main Street. Sidewalk water bowls and treats are everywhere, and almost all welcome leashed pets inside, including Emma’s Lake Placid Creamery. A 1950’s feel takes you back in time, and the generous servings of 20 flavors of soft and hard home- made ice cream will bring you back for more. Dogs are served their own special treat, topped with a bone shaped cookie. And when it comes to epicurean adventures, you and your chow hound will find Lake Placid’s varied dining experiences world-class and delicious. Many eateries have outdoor seating. Big Slide Brewery and Public House, just outside of town, offers local, fresh, farm-to-table fare with a gourmet flair. Their staff goes the extra mile to make pets feel welcome and their grounds are dog friendly. After a great day in the great outdoors, Lake Placid offers a variety of bars, a movie house and a series of entertainment events throughout the year. A fun place to spend an evening is the dog friendly Delta Blue restaurant and bar. Hang out with your furry best friend on the patio, enjoy “Southern barbecue up North” and listen to live music weekly on Fridays, Saturdays and Wednesdays. Delta Blue is part of Hotel North Woods, an all-suite hotel on Main Street. This iconic hotel wrote the book on pet friendly. In fact, in addition to their signature custom pet beds, pet dining stations and homemade Nutty Maple Bacon Dog Treats, complimentary in every room, their Outward Hound program provides guests with a guide book to pet friendly locations and hikes in and around Lake Placid. To find out more about pet friendly Lake Placid, call the Regional Office of Sustainable Tourism at 518-523-2445 or visit their website at http://www.roostadk.com.